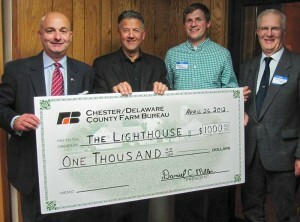 Joe Fecondo, the local Farm Bureau's vice president (from left); Ed Herr, president of Herr's; Thomas Matthews, a Farm Bureau board member; and Dan Miller, the bureau's board president, display a donation check for the Lighthouse in Oxford. WEST CHESTER – When the original Herr’s potato-chip factory burned to the ground in Lancaster County, its founder, the late Jim Herr, had not lost his appetite for business. So, in 1951, he and his wife purchased a farm in southern Chester County, eventually growing it into a snack-food empire with 1,500 employees and annual sales of over $200 million. That was one of the lessons in perseverance shared by Ed Herr, one of the founder’s sons and the keynote speaker last week at the Chester Delaware County Farm Bureau’s Spring Banquet at the Goshen Fire Hall in West Chester. About 135 members and a host of politicians and guests attended the event, according to the Farm Bureau. Ed Herr also spoke about the family-operated business’s connections to the local community, where he is involved in a variety of local and national non-profits and religious organizations. 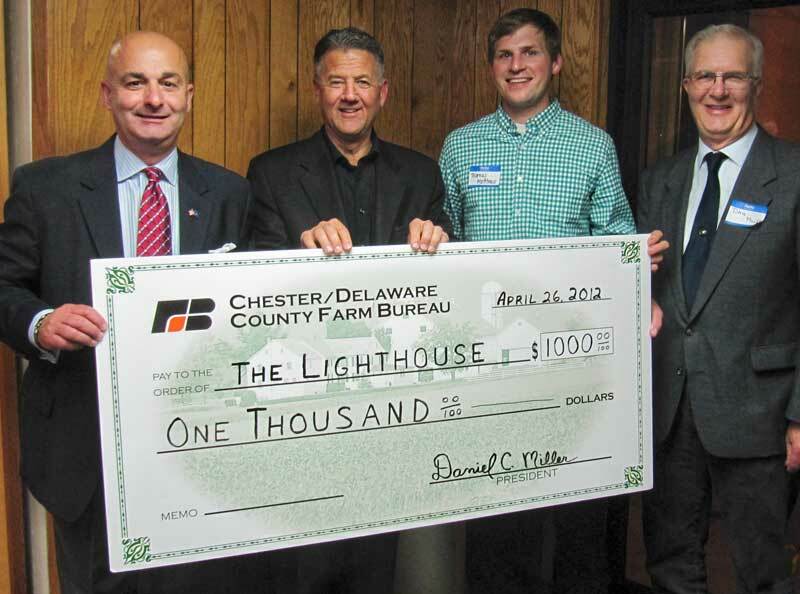 Sharing that commitment, the Chester Delaware County Farm Bureau presented Herr with a check for $1,000 for the building campaign of the Lighthouse Youth Center in Oxford. Other speakers at the banquet included the Farm Bureau’s Deborah Ellis, who described a statewide agricultural education program that makes use of mobile labs for students; Douglas Fearn, president of the Lyme Disease Association of Southeastern Pennsylvania, Inc., who pointed out that Chester County residents, who live in the epicenter of the highly debilitating disease, need to take precautions against it; and Daniel Naylor, a regional director at the Pennsylvania Department of Agriculture, who reviewed the wide-ranging responsibilities of the state agency. The Chester-Delaware County Farm Bureau is a voluntary organization of about 6,000 members that works to advance the interests of agriculture and rural communities by working with policy-makers at state and federal levels. It is affiliated with the Pennsylvania Farm Bureau and the American Farm Bureau Federation.